give the water a pleasant lemony flavor. Another category to compete in at a Federated Flower Show, like the one Penn-Cumberland Garden Club recently held is in the "educational displays". This was one of the categories Susanna competed in. Her educational display was on Culinary Herbs and featured cut specimens from our herb garden, all labeled with how they are used. It also had tips on making herb vinegar and on drying and preserving herbs. Our favorite way to mince herbs with kitchen scissors. This display class featured a collection of 5 - 10 herbs, properly labeled and creatively displayed. This 'Thyme' Display, with its clever play on the word time, won not only first place but best over all in the show!! 'Mints for the Tea Lover' was a fun herbal display cleverly utilizing a pitcher and matching cups placed on a colorful serving tray. A personal favorite is this display to the right, created by an old family friend, that included a quote from Bertha Reppert's book The Bride's Herbal! "Herbs have ancient symbolism. They don't shout, they whisper... Herbs make all the difference in the world." The ceramic birds add a colorful touch to this display. At Penn-Cumberland Garden Club's recent flower show entitled "Nature's Celebration", there was a class that featured a Vegetable Display. In a display category, you are judged on two different components; the health of the specimen and the staging and overall effect of your display. You must show a minimum of five properly labeled vegetable varieties with upto a maximum of 10 types. You can display them in a variety of ways, using three tier trays, baskets, bowls, or cutting boards. This is where you get to have fun and be creative as long as you stay within a 2 foot by 3 foot area. The striking blue ribbon winner is below! 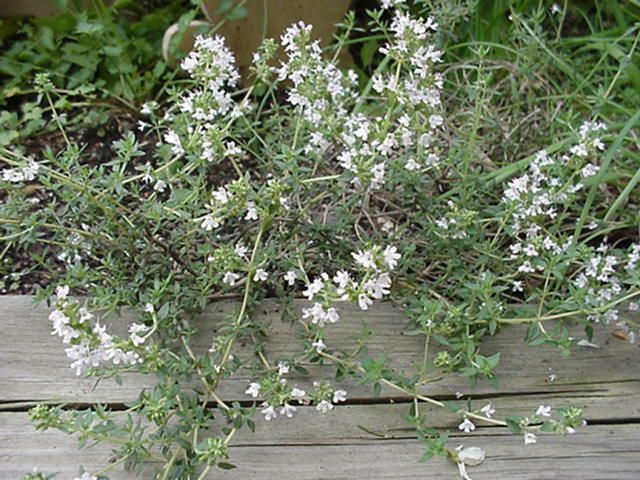 Thyme is a favorite little herb. We love to add it to vegetables and to chicken dishes. 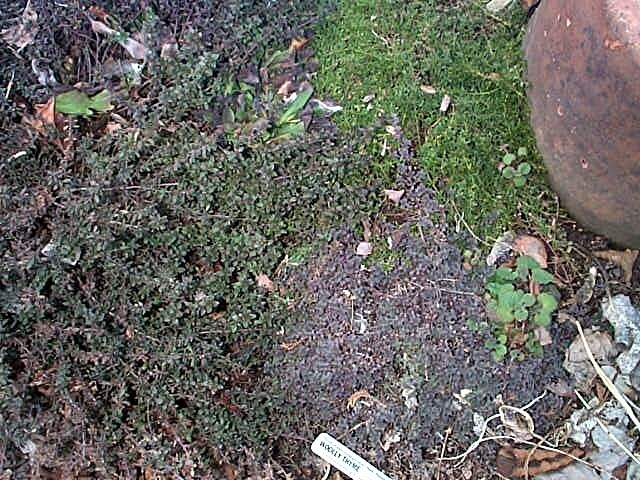 It comes in upright varieties pictured here. They never get much taller then 12 inches and will bloom in soft white and pink colors. It will gently spill over the edge of the bed. 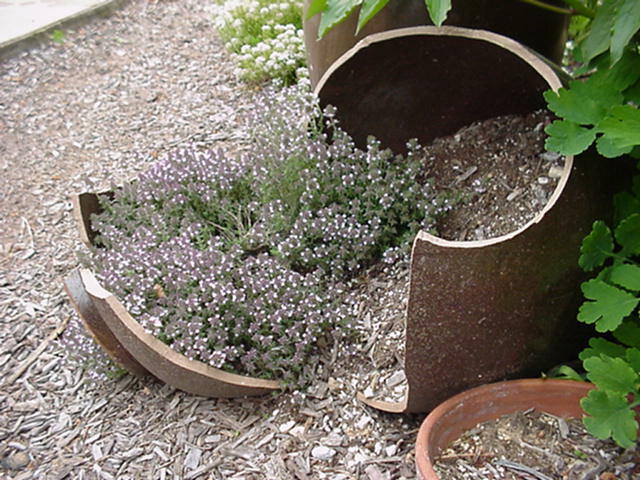 Creeping Thyme stays quite small and will grow in cracks and crevices. It will tolerate light walking and so it is perfect between steeping stones. 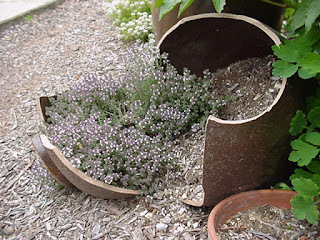 In the garden bed creeping thyme is a favorite of the garden fairies as they enjoy nestling in for a nap on a bed of thyme. The Mid-Atlantic Tea Business Association held their Quarterly Meeting at One Steep at a Thyme in Jamesburg, NJ earlier this month. Owner and fellow MATBA member, Kathleen Hippeli hosted the event in her Elegantly Victorian.. Graciously Country (tm) tea room. Since the meeting was held in July, Kathleen coordinated a Red, White and Blue BBQ, Tearoom Style. The festive theme was carried out with the menu, the printed menu, the tablecloths, and miniature flags proudly on display throughout the tea room. The first course featured a Red, White & Blue Salad that was made with mixed greens with strawberries, blueberries, goat cheese, pine nuts, and a house raspberry vinaigrette. A crispy Parmesan toasted teapot topped the salad. The tiered tray held the Tea Sandwiches and Savories that consisted of a Herbed Cucumber Sandwich, Blue Cheese Stuffed Cucumber and Tortellini Antipasto Salad on the top tier. The bottom tier held a petite Cheese Burger in a "Bun", miniature Hot Dog on a Stick, and an Eggplant Parm "Burger". Kathleen definitely captured a Fourth of July BBQ picnic with her unique variety of sandwiches and savories. The table was laden with food and drink. In addition to hot tea flavors, there were two iced tea options also. Dessert featured Brownie & Ice Cream Waffle Bowl Sundaes. A choice of ice cream was offered, and toppings included whipped cream, sprinkles, and a cherry on top. Notice the darling ice cream cone spoon that was used with the dessert. Fun! Prior to the business meeting, Kathleen shared a brief presentation on iced beverages. She demonstrated a variety of flavored drinks, and members sampled each one. There were some unique flavors. Afterwards, MATBA President Mike Raab of Tea for All conducted the business meeting. When the meeting wrapped up, it was time for members to head home, knowing we would connect again on October 17th at the next Quarterly Meeting to be held at The Orchard Tea Room at the Rose Hip Barn in Thornton, PA. MATBA member Karen Donnelly will be the hostess for this event. The Quarterly Meeting for the Mid Atlantic Tea Business Association (MATBA) was held on Monday, July 11th at One Steep at a Thyme in Jamesburg, NJ. A carpool of MATBA members (Susanna from The Rosemary House, Lin from Tickle Your Fancy, Marcella the Tea and Hat Lady, and Janet from Over the Teacup and not pictured, Nancy from Sweet Remembrances) traveled from PA to NJ for this old-fashioned Fourth of July inspired meeting. MATBA meetings always begin with a welcoming session where a nice selection of hot teas are offered along with an assortment of breakfast treats. Since most members travel a distance to each meeting, it's a nice opportunity to unwind from the journey and to greet members as they arrive at staggered times. Owner and MATBA member Kathleen Hippeli prepared a nice variety of assorted scones and delicious toppings, croissants, mini quiches, and fresh fruit salad. Touches of red-white-and blue could be found around the tea room. Once everyone arrived, the morning presentation, Tea Vessels = a way to steep up tea sales was presented by MATBA member Darlene Meyers-Perry of The Tea Lover's Archives. Darlene also maintains an interesting tea blog, The Tea Enthusiast's Scrapbook. This presentation on Tea Vessels was the same program that Darlene recently shared at the World Tea Expo held in Las Vegas. Those of us that were not able to travel to the Expo were particularly appreciative that Darlene was willing to present the program to the Association members. Special thanks to Darlene for her informative and interesting program. It's a wide wide world of tea accoutrements, and a journey in acquiring them and learning to utilize them! This past June we vended at a new lavender festival only 10 miles from us, at Castle Creek Farm! It is so exciting to have an herbal event so close to home. Castle Creek Lavender Thyme Faire celebrated their 3rd year for this festival where they promote all things herbal, along with lavender, thyme, honey, and fiber. This event featured talks and vendors focused on lavender. The gardens were well labeled so you could learn which lavender plant you wanted to plant in your own gardens. While it is a relatively new event and you can see that reflected in the size of the lavender plants in the field, it is going to be fun to watch this festival grow. One of the highlights was watching the llama shearing on Saturday. Castle Creek Herb Farm in Dillsburg, PA is the host of this festival. Angelica's favorite parts were the horses including the mini's, and the lavender ice cream!! They had chocolate lavender, raspberry lavender, and vanilla. Yum! Cedar's favorite part was playing with the boys in the creek. This event is a winner for the whole family! The final mansion we visited on our traveling bus tour was Pennsbury Manor, the re-created country estate of William Penn. This is a living history museum that takes us back to the 1680's, an era still dependent upon travel on the Delaware River. William Penn received the land of Pennsylvania (Penn's Woods) from the King to settle a debt owed to his father. While William Penn only lived in America for 4 years, he founded a government that was built on representation of the people, ethnic and religious tolerance and a fair jury system. William Penn was fair with the Indians and other land owners and entertained many here in this home just up the river from the city he designed, Philadelphia. The withdrawing room, a private room just for William Penn for coffee, tea or hot cocoa, all expensive commodities in the time. In the large Kitchen garden many herbs were grown, and even more vegetables for the manor, the guests and the servants. The cistern in the middle was filled with water from the river. The Margaret R. Grundy Memorial Museum, overlooking the scenic Delaware river, was established by the late Senator Joseph Grundy. It represents the later part of the 1800's and is an excellent example of a Victorian Era Residence. The decor and furnishing constitute a fine Victorian residence of the era. The woodworking in this mansion is amazing, with carved oak paneled walls and a majestic staircase in the foyer. This mansion was located in the center of the town. It was an extensive property but the grounds were obviously very well maintained. A glimpse of the peaceful river can be spotted in the background of this arbor. The guides told us about an amusement park that used to be located on the island directly across from the mansion. And a few displays from the bedroom.